A third rail is a method of providing electricity to power a railway through a continuous rigid conductor alongside the railway track or between the rails. It is used typically in a mass transit or rapid transit system, which has alignments in own corridors, fully or almost fully segregated from the outside environment. A list of lines or networks equipped with a third rail is below. 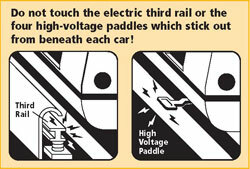 Third-rail systems generally supply direct current to power the trains. In the early 1900s the third-rail system was used to power early rollercoasters such as the Rough Riders in Coney Island, New York.